Learn secrets never revealed by anyone on the feeding and striking habits of the most sought after of the billfish and gamefish the grander. This is one of the most spectacular big game fishing videos ever produced. Well known underwater photographer and angler Gerard Aulong spent a full season fishing and documenting the big game action off Ghana along the western coast of Africa. During that time he compiled underwater footage of hundreds of Blue Marlin crashing the baits. This one hour video combines the very best of that footage and includes multiple granders from both above and below the surface of the water. Watch as giant blue and black marlin strike lures from underwater camera view. Many tricks can be learned from this fishing video that have never been known before. Not only is this video going to become something you will watch over and over again just to see what you missed each time but it is for a very good cause as well. 45% of the proceeds from this video will help in cancer research. The sun is more damaging to the skin than most realize and with your help buying this video some of the money goes directly into finding out more and better ways to protect you skin from the harmful damage caused by exposure. I will guarantee that if you are not 100 percent satisfied with the purchase of this video I will refund your money less shipping and handling on the purchase of this fishing video from me. 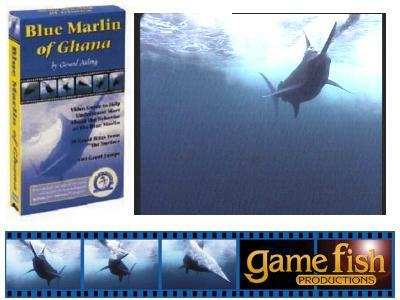 Watch as the giant marlin attack fishing lures at their levels underwater! Learn just how to place your hooks on your lures to improve strike to hookup ratios of the billfish. It is a must have for any avid fisherman or club and will allow you to see just how marlin get hooked up.